In a previous entry, I wrote about a literal blank wall I'm having and how to add color to this wall to complement the front garden. When we had the old house, we had the "climbing fig" vine on this wall. Don't know what that is? The climbing fig is also known as Ficus Pumila. Here's how it looks like on a wall. 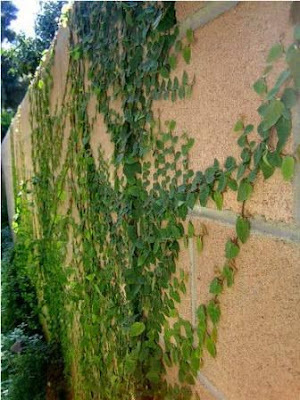 Ficus pumila (creeping fig or "climbing fig") is a woody evergreen vine that is native to East Asia. As the common names would suggest, it has a creeping habit and is often used as a houseplant. It is hardy and fast growing and requires little in the way of care as long as the soil is not allowed to dry out between waterings. There are several cultivars, including a variegated and crinkled leaf form. Ugh. When the woody remnants are pulled, some of the paint on the wall get peeled off. It's THAT bad. So now I don't plan on growing this plant on the wall anymore. Here's how we finally removed the aerial roots left by the dead creeping fig.